We like to keep a close watch on the inventory of distressed properties for sale in Tallahassee. It serves as an overall bellwether for the state of the Tallahassee real estate market, knowing that we have a lot of short sales and foreclosures that still must clear before our market can return to "normal." Overall, we are starting to see a non-seasonal decline in the number of distressed properties that are entering the market. I suspect this is good news, though there is likely some pent-up supply of short sales with upside down homeowners waiting to see what happens with the Mortgage Forgiveness Debt Relief Act. Rumor has it that this will be extended in October, retroactive to include all of 2014 and continuing through all of 2015. Regardless, the numbers are looking better right now. The following real estate graph shows the short-term and long-term trends for distressed properties listed for sale in the Tallahassee MLS. In the graph above, the black bars show the number of distressed properties listed each day. It is important to note that we are attempting to focus primarily on non-investment properties, so we are only looking at distressed properties listed for sale priced above $100,000. 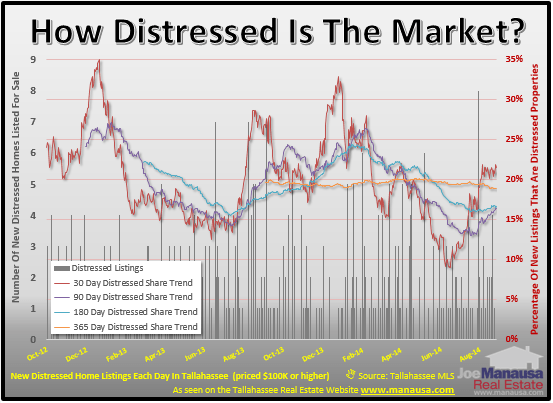 The shortest trend is the red line, which measures the ratio of distressed properties to all properties listed for sale. Over the past 30 days, 22% of all listings were categorized as distressed properties. The purple line shows the 90 day trend. Over the past quarter, 17% of all new listings were distressed. The blue line shows the 180 day trend, meaning over the last 6 months, 17% of the properties were distressed. Finally, the orange line shows the one-year trend. Currently 18% of all properties listed over the past year were distressed. That's down about 1% from this time last year. Note how the orange line (the one-year trend) has hardly moved, falling and rising in a one to two percent range. That shows you just how consistent these listings have been streaming into the market. The shorter term trends move around a good bit, suggesting there are seasonal times to expect to see a greater percentage of these properties. This is less likely due to distressed sellers, and more likely due to arms-length sellers becoming more active during the Spring and Summer months. The following list shows the ten most recently listed distressed homes for sale in Tallahassee. It will be updated twice each day, so come back as often as you like to see the newest short sales and foreclosures on the market in Tallahassee. If you are still thinking about short selling your home, check out our free short sale resource that you can download here. It's more than 80 pages of information and contacts that will help you decide whether or not to short sale your home. Of course, if you would like a FREE consultation about the risks and potential rewards of a short sale, just drop me a note and we will schedule a time to meet with you and evaluate your home and your situation.